Our two breeding females are part of our daily lives, get lots of attention and love and go everywhere with us. 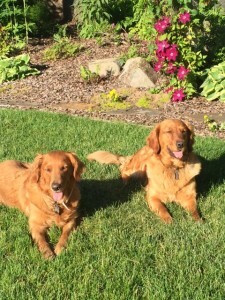 Our female Goldens were purchased from Sungold and Topbrass Kennels. For over 50 years the trademark of Sungold Kennels has been Golden Retrievers with field trial characteristics: intelligence, “birdiness”, drive, strong in the water and love to retrieve. Our female Goldens as well as the male dogs we select to breed our girls to have been tested and received clearances for hips, eyes and elbows. We breed very selectively with temperament and health being our biggest priorities. Our goal is to produce dark colored, multi-purpose Golden Retrievers; structurally sound, healthy and confident. 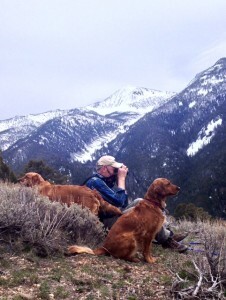 Our Goldens have calm temperaments that make great hunting partners and wonderful family companions. Our females are medium sized dogs as outlined in AKC standards, maturing at 55-58 lbs. Our male puppies have been maturing at 65-78 pounds.